If you want to travel to Western Georgia for a weekend, you could fly to Tbilisi and rent a car there or fly directly to Kutaisi airport and rent a car in Kutaisi. Follow the road to Western Georgia. It is fast but boring. Basically, you travel on a freeway and pass different villages. Some of these villages offer their own specialties. For example, Surami is known for its nazuki, a sweet lavash bread baked in the Georgian clay oven, the tone. You will meet Nazuki sellers all along the road. Often, they stand waving the bread, luring travellers to stop and buy one. It is a common knowledge that, alas, nazuki nowadays is not as it was in the past and everyone claims that they know the only spot on the road where the real deal is sold. Try one as a quick snack before the canyon pass. After the canyon, you will encounter the village of Shrosha, famous for its clay products. These come in handy as souvenirs, since many Georgian dishes are often cooked in clay pots, called ketsi, and wine is poured from clay jugs. Finally, you will pass Zestaponi, famous for – wait for it – Lavazza coffee! It is an unusual, non-Georgian thing, refreshing after three hours of travel. So, years ago one guy decided to open a coffee spot and imported Lavazza coffee. He started selling coffee to go. His business was so successful that other villagers started their own coffee huts. Now, there are several on both sides of the road, offering various kinds of beans. Just like grabbing a nazuki in Surami, drinking coffee in Zestaponi became an integral part of my travelling tradition. And I do not even like coffee. Kutaisi comes after Zestaponi. It is the capital of the ancient Colchis Kingdom. Visit the historical centre, enclosing 19th century buildings, including a school, originally established as a boys’ gymnasium. The pedestrian bridge over the Rioni River is also a popular tourist attraction. In that place, you will find, my two favourite cafés in Kutaisi: Foe Foe and Palaty. Foe Foe is inside the foyer (foe in Georgian) of a constructivist building, typical for the beginning of the 20th century. The double entendre is that Foe Foe also means fancy-shmansy. You will see the walls of the café covered in Petre Otskeheli’s costume sketches. He was a Georgian modernist set and costume designer, whose unique artistic vision was punished by Stalin as he was executed during the purge in 1937. Foe Foe serves Althouse teas and lunch dishes. Palaty is a cozy little place, with live music on weekends. It offers tasty European and Georgian dishes. It has two stories, one smaller, one larger, both with interesting décor, reminiscent of 19th century Kutaisi. After culinary adventures, take a ride in an air tram to the park on the hill for the best view of the city. Afterwards, drive up to the Bagrati Cathedral, built in the 11th century and part of UNESCO’s world heritage sites. It is also well-known for its recent reconstruction which aimed at a harmonious blend between ancient church and new building materials. Some call it innovative while others criticise it for ruining its authentic medieval architecture. 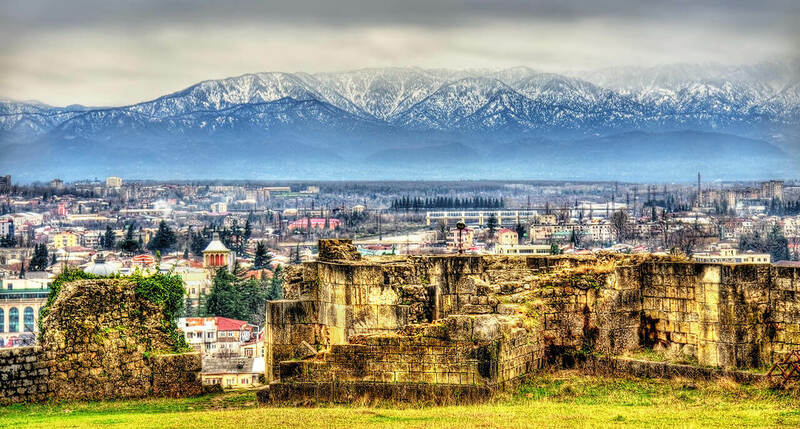 Drive up to the Gelati complex, built during the Georgian Golden Age in the 12th century, for a perfect ending to your cultural exploration. The Gelati Academy is one of the oldest educational centres in Europe. It has preserved manuscripts dating to the 12th century. It is also a burial site for the Georgian King, David the Builder. 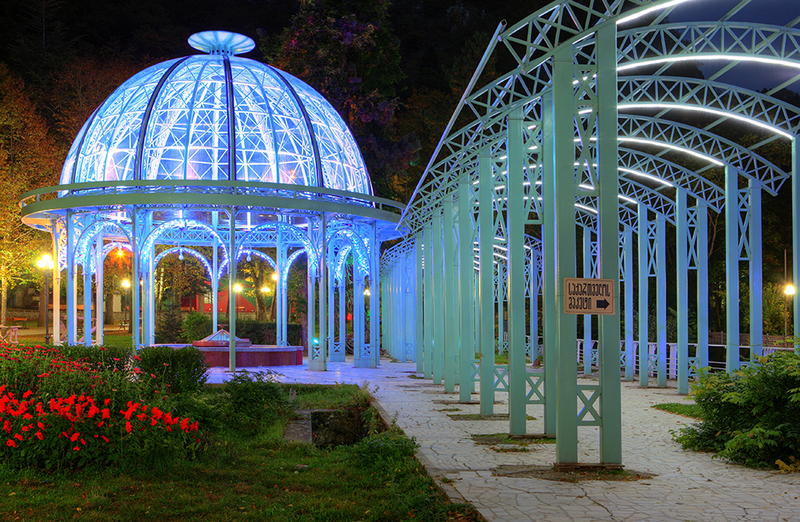 On the second day, visit the natural attractions around Kutaisi. Drive to the Sataplia cave to see a dinosaur footprint, preserved in the cave since the Jurassic period. The guide will inform you about the local geology and cave formations. The Sataplia cave has a glass bridge outside, a perfect spot for pictures. The Prometheus cave is not far from Sataplia and is actually larger and more beautiful (no dinosaur footprints though). If you like stalagmites, stalactites and weirdly-shaped cave formations, this is a place for you. Make sure to buy the boat ride at the entrance. You can buy them separately. After you finished with cave touring, you will present the boat ticket and take an exciting boat ride on an underground cave river! You will exit the cave via the river (and will have to walk up back to the parking spot). Finally, your last destination – the Okatse canyon and the Kinchkha waterfall. The Okatse canyon has a viewing platform overlooking a drop of 100 metres. The view is breath-taking. Drive to the nearby Kinchkha waterfall, one of the highest (and hardest to pronounce) in Georgia. After visiting the canyon and the waterfall, you will understand why many people call Georgia a beautiful country. Be advised that the canyon road may be closed during rainy weather so ask about it while you are still down in the caves. By the time you are done with these natural wonders, you will be exhausted. Now you can drive back through the same villages, passing coffee huts, clay pots and nazuki bread. Once you bite into your second nazuki, you will know that the adventure is almost over. Soon, you will be back in Tbilisi. 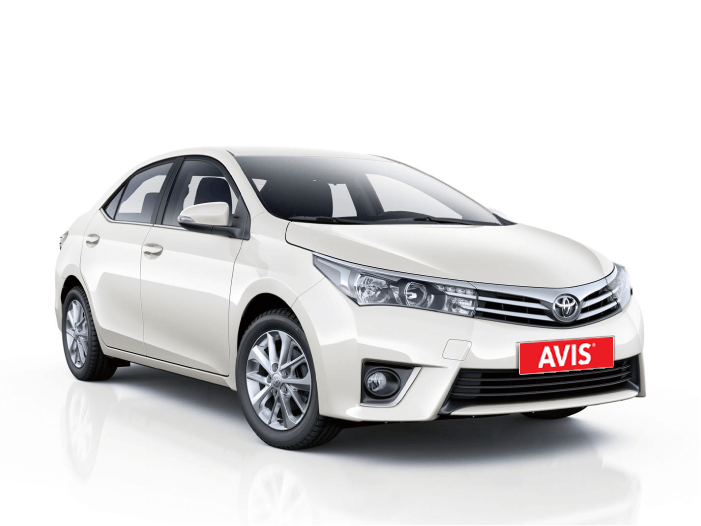 For maximum comfort rent Toyota Corolla!